Stranger Things has been nothing less than a complete cultural phenomenon. The award winning Netflix original series has been one of the most popular and critically lauded TV shows of recent years, and now fans will be able to explore the world of the Upside Down with a new comic from Jody Houser (writer), Stefano Martino (penciller), Keith Champagne (inker), Lauren Affe (colorist), and Nate Piekos (letterer). Today we're revealing two radical bits of exclusive art: the full back cover poster which fans can assemble by collecting all four issues, and a New York Comic Con exclusive cover by Fabio Moon. To celebrate, I chatted with the creative team about reimagining Hawkins and the responsibility of taking on a beloved property like Stranger Things. Both of the creators were thrilled about taking on the project. For Houser, it was her love for the show. "I was super excited! I actually dressed as variations of Eleven for two Halloweens in a row, so I was obviously a fan. The hardest part was not breathing a word about it for six months!" Houser enthused. Martino said it was all about working with Houser. "I felt very excited…and then immediately felt a lot of pressure. I know that I can't make mistakes or take on this project without giving the right respect to the fan base. They deserve the best. Then, just when I started to relax a little bit, I found out that Jody Houser was writing the series. I've read her work in Faith and truly admire her. So imagine that. I drank a lot of chamomile tea that night." We got a sneak peek of the first issue, and it's a brilliant expansion on the cult smash show. The team decided what to explore in the comic through discussions with Netflix. Houser explained, "A lot of it was working with Netflix and figuring out what areas of the world we could play in. Since Stranger Things is still ongoing, both in terms of the show and in other media, we have to tread carefully. Luckily, Will's story is one we were very excited to tell." Exploring Will's time in the Upside Down meant Martino got to explore some of the nuances of Stranger Things' vast visual landscape. "I consider backgrounds as more of a character. If you pay attention to the series carefully, you can see a lot of details that only appear for a few seconds that subconsciously influence the reader's feelings. I took this level of detail really seriously because Jody's great storytelling and world expansion deserves the right graphic support." Martino continued, "On the other side, I focused my art on the more natural and emotional storytelling. I want readers to feel the fear of Will in his face and his entire body. This series doesn't have superheroes flying around or laser beams, so the reader will need to pick up on the subtle graphic hints about what characters are thinking. At the same time, we are in the comic book medium that has its own rules, which means that I have to manage the layouts with extreme attention. I also should thank Spencer Cushing, the editor, for advising me on the pages." A really fantastic theme Houser expands upon in the book is Will's use of roleplaying games to survive the horrors of The Upside Down. "Dungeons and Dragons was such a core part of the series, both in terms of the boys' friendship and their understanding of the monsters they faced, " she said. "It made sense to continue that thread in the comics, especially as a way to bring Will's friends into the book via his memories of playing." 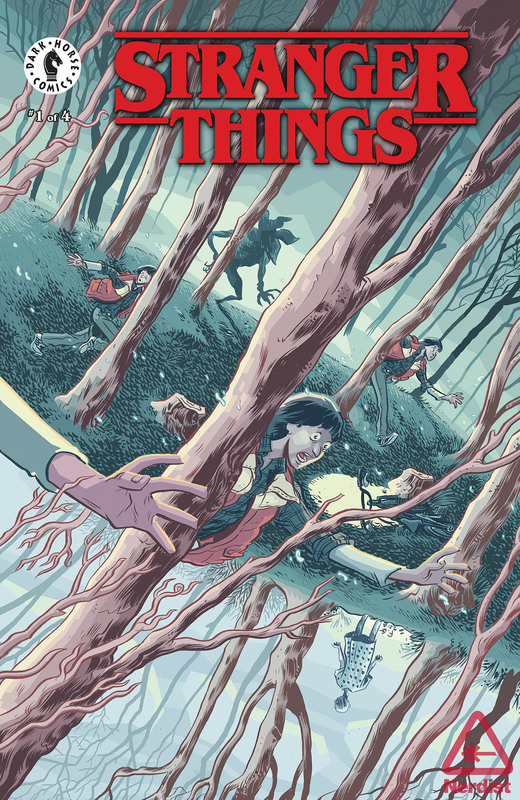 As for what the pair is most excited for fans to discover in the series, Houser teased some things happen in the Upside Down that fans may not expect, while Martino has a more specific moment he can't wait to discover and shared the exact location with us: "I think Stranger Things #3 page 14 will be a big hit for fans." Will you be picking up Stranger Things when it hits shelves on September 26? Excited to discover more about The Upside Down? Just hoping for a lot of good Eleven action? Let us know below!